Where possible don’t use your mobile phone whilst driving please! In fact, changing the radio station, unwrapping a sweet, reaching over the car for something or even talking to passengers can be distracting you from your responsibilities on controlling a large chunk of metal. Whilst driving, your first priority must be to operate the vehicle safely and be aware of your surrounds. To make sure this message is in the forefront of drivers minds, as of March 1st 2017 the Fixed Penalty Notice for using a handheld mobile phone while driving will increase to £200 and 6 points on your licence. As a driver, if you haven’t turned off your engine completely, your phone is in a 45-degree angle of your view, you have the phone to your ear, on loud speaker or you touch the screen you could be eligible for this penalty. For young and newly-qualified drivers this may lead to an automatic ban. There is an exception for two way radios and for making an emergency call to 999 or 112 as long as it’s unsafe or impractical to stop. For more information, please read the AA web page. There may be occasions that you need to use your phone, including using the satellite navigation or to make or receive an urgent calls. It’s essential to make sure you have a phone holder (out of the 45-degree angle,) the devices has the correct settings, you’ve preprogrammed your route on the Sat Nav and that your phone’s successfully paired with your car before you start your journey. For those who have a car with Bluetooth built in as standard, hopefully there should be some instructions in your cars manual how to connect and sync your phone. For those that don’t have it built in, you can either purchase a Bluetooth car kit that you can connect directly to the power and speakers or purchase a wireless FM transmitter that uses a channel on your radio. Check your Bluetooth, GPS and Mobile Data are switched on, also consider the screen brightness is up and that you are charging your device if necessary. Another overlooked setting can be to check that your phone doesn’t automatically lock which would restrict some features. This can be achieved by either taking off automatic locking or having Smart Lock setup on your Google Android device which trusts your car to not unlock whilst connected to it’s Bluetooth (amongst other trust detection features,) or CarPlay for Apple’s iOS devices when used with selected cars and stereos to control Siri. With the Google devices, you can say “Okay Google” or your Apple device say “Hey Siri.” To use these features, make sure you have your Google or Apple device set to do action your command. You should now be able to speak to your device and ask the Sat Nav to send you on a diverted route, to a petrol station for example, or call one of your contacts. 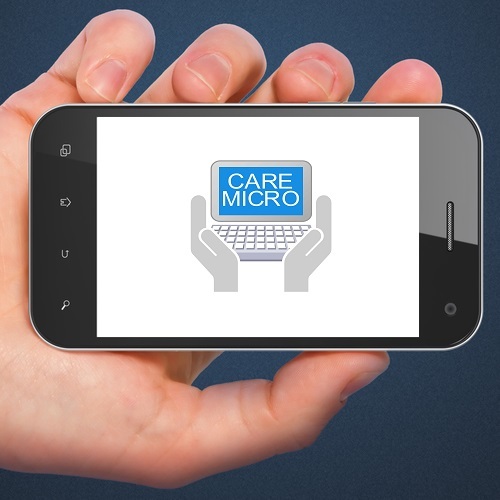 Contact Care Micro Systems to help select the right mobile phones for your business or guidance on how to work your existing devices. As always, please make sure you contact them safely and legally!